the breakfast klub is central to Houston’s daily life…lokal politicos kome here to powwow; downtown lawyers and CEOs congregate and debate; families gather after church; university students kan kome in for an affordable meal and bottomless kups of coffee; Medical Center patients and visitors know they kan stop before or after appointments for healing treatments of the kulinary kind…make no mistake, the breakfast klub is a Houston institution and a destination spot for every visitor in every sense of the word. Our restaurant is rooted in principles of faith, family, kommunity and empowerment; we treat every customer like our family and we believe that family is the cornerstone of any community, so we place an emphasis on supporting activities and causes that enrich and strengthen families. We’ve been blessed to keep our doors open for you receiving numerous accolades and satisfied customers from all over the kountry. We are inspired by a passion to provide every kustomer with good food served in a soulful atmosphere…every time you visit. It’s very important that everyone on our team shares the same level of kommitment, dedikation and enthusiasm to keep the kustomers’ needs first, from the moment they get in line until we bid them farewell. Hungry Houstonians and city visitors line up to savor the flavor of southern specialties like “Katfish & Grits”, “Wings&Waffles”, and buttery biskits to rival anyone’s grandma. People often ask us what makes customers willing to stand in line at the breakfast klub, and we say, “It’s not a line, it’s fellowship! 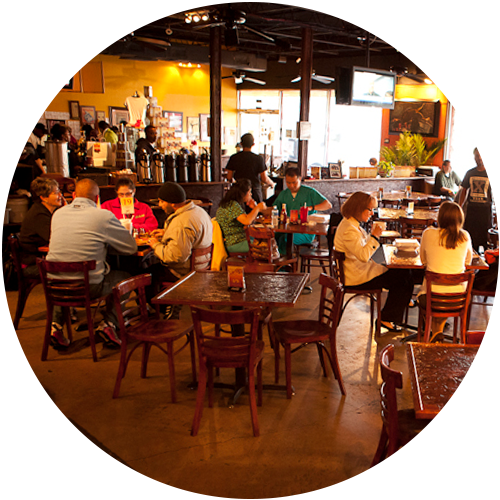 We make sure the experience at the breakfast klub is worth the wait! It began many years ago while working alongside my brothers in my father’s Houston katering business that I discovered the value of good food and the importance of a great kustomer experience. As Chief Steward for this venture, I recognized a need for a good breakfast restaurant in Houston, found the perfect location and opened the breakfast klub in September, 2001 featuring two signature dishes: Katfish & Grits and Wings & Waffles. Built on foundational principles of faith, family, kommunity and empowerment, the breakfast klub likes to treat every customer like family! We’ve been blessed to attract visitors from all over the country and garner recognition as one of the “best breakfast restaurants in the nation” by Good Morning America, USA Today, Esquire and Forbes, plus recognized by the Houston Press 2011 Readers Choice as best breakfast, 2011 My Table Culinary Award winner for favorite breakfast and Best Of Citysearch 2011 winner in the breakfast category. As a family-owned company, we can relate to the pride you feel in pleasing the people who matter most, that’s why we promise to always provide quality products and a great customer experience with a friendly smile… every time we see you. Our menu items at the breakfast klub were selected with our guests in mind and every day the breakfast klub is fueled by my father’s passion for good food and fellowship.